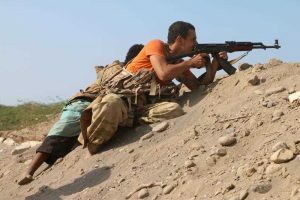 Violent clashes and confrontations have erupted between Houthi militia and National Resistance Forces in the port city of Hodeidah on Saturday, dealing a new blow to a fragile truce, an AFP correspondent reported. Mortar, artillery as well as machine-gun exchanges rocked the southern part of Hodeidah in early morning before tapering off later in day, the correspondent said. The militia-controlled port city, which is a lifeline for the delivery of desperately needed humanitarian aid, was for months the main front line in the Yemeni conflict after government forces supported by Saudi Arabia and its allies launched an offensive to capture it in June. However, last month the warring parties agreed a ceasefire for Hodeidah during UN-sponsored talks in Sweden. The United Nations has said the truce has largely held since it came into force on December 18 but there have been delays in the agreed pullback of rebel and government forces. The Houthis control most of Hodeidah while government forces are deployed on its southern and eastern outskirts. Since the Saudi-led military coalition intervened in support of the government in March 2015, the conflict has killed nearly 10,000 people and unleashed the world’s worst humanitarian crisis, according to the United Nations. UN aid officials say 80 percent of the population — 24 million people — are in need of aid and nearly 10 million are just one step away from famine. UN aid coordinator Lise Grande visited Hodeidah on Friday and met local officials, the head of Yemen’s National Authority for the Administration and Coordination of Humanitarian Affairs, Jaber al-Razahi, said. “The reason for the visit of UN humanitarian coordinator Lisa Grande to Hodeidah is to see the humanitarian situation… and ensure the arrival of aid through the port,” Eazahi said.